As surprising as it might sound today, we believe the secular trend for commodities has higher elevations to travel, before eventually running its course - possibly as far out as early into the next decade. While in 2011 we became adamant that the thesis trade in commodities - specifically in its leading sector of precious metals, had become crowded and overhyped, those excesses have been wrung out of the markets over the past three and a half years and offer what we perceive to be extremely compelling long-term valuations going forward. This idea remains supported by our research that implies yields are not headed materially higher anytime soon - despite the anxieties surrounding the Fed raising interest rates over the next few years. Moreover, we expect that real yields (nominal - inflation) will remain suppressed and eventually retrace the rise that began in the back half of 2011. When the real yield cycle finds its zero bound and breaks below, commodities tend to outperform in the market over an extended period of time. All things considered, the death knell spike in real yields that has historically punctuated the end of major commodity booms in the past - has yet to appear for us on the horizon. Over the years we have shown a long-term Hawking view of the nominal yield cosmos, which depicts an antithetic and gradual troughing, versus the violent and exhaustive secular peak in yields the markets experienced in the early 1980's. While 10-year yields this year have retraced back to the mid point of our expected range (1.5%-3.0%), taking into account the symmetrical structure and mirrored return of the long-term yield cycle, an estimated secular pivot higher would not take place until early in the next decade. 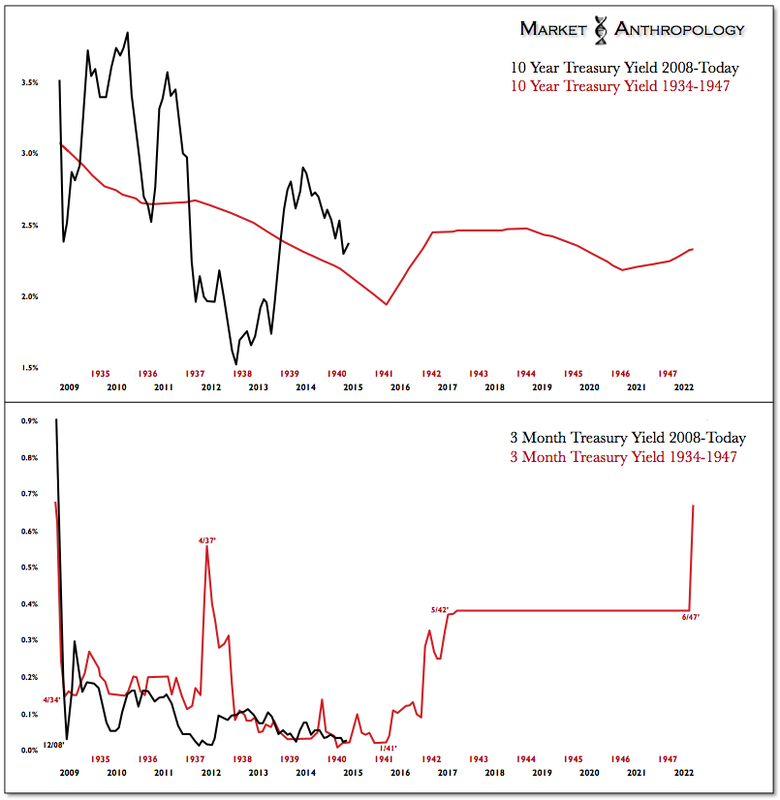 When it comes to a roadmap for short-term yields going forward, we looked back at the last time 3 month Treasury yields broke below 0.5% in 1934 and troughed over the next 13 years until 1947. 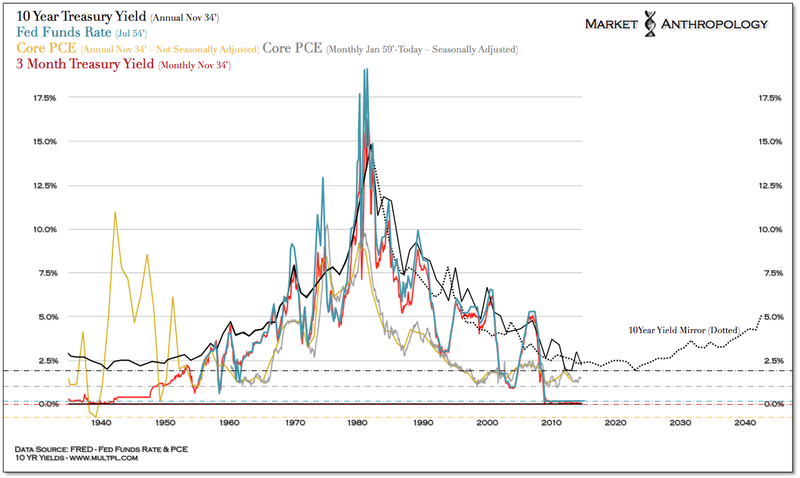 Notwithstanding the failed rate hike regime by the Fed in 1937, the current market has closely followed the historic comparative performance trajectory of that time. Interestingly, by normalizing a duration study to that period (see below), the estimated run below 0.5% would also extend early into the next decade. Although the Fed may tweak short-term yields gradually higher at some point in the future, the expectations by participants of a one - and certainly two or three handle, in front of the fed funds rate - appear wildly optimistic over the next few years. We believe the extended and gradual basing structure of the historic cycle reflects more realistic expectations for yields and the natural equilibrium that the Fed will ultimately be guided and constrained by - just as they were across the trough of the cycle last time around. As shown in our first chart that depicts both the long-term nominal and real yield cycles, commodities have outperformed along runs leading up to the nominal peak in yields and through the nominal trough of the cycle. 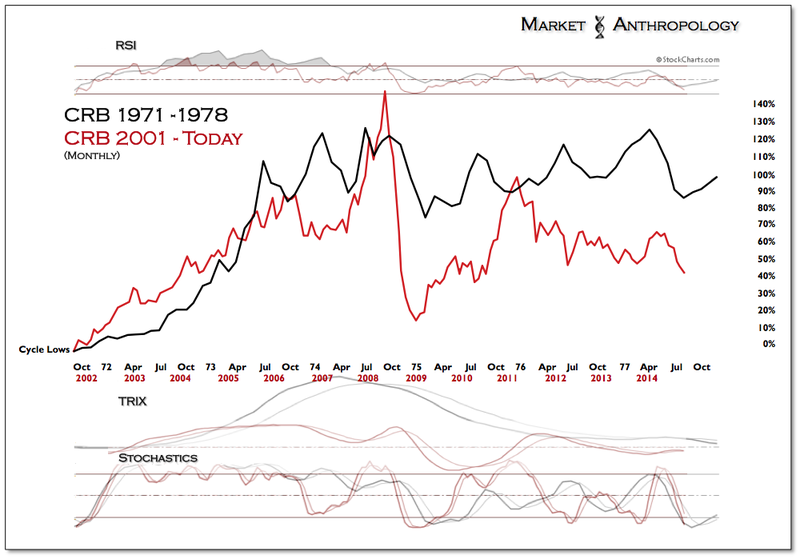 From a comparative perspective, the 1970's commodity boom that ran commensurate with the yield peak was roughly half the duration of the commodity boom that ran through the trough in the 1930's and into the early 1950's. This makes logical sense to us, considering what we know of the nominal yield cycles structure - i.e. shorter exhaustive highs versus long drawn out troughs. When comparing the performance of the CRB index between the 1970's supercycle and today, you might come to the initial conclusion that the current cycle hasn't been that super after all. In fact, the current cycle (as expressed by the CRB) would roughly fit within the performance envelope of the first leg of the 1970's market (71'-78') - despite being more than twice as long. Complicating the tea leaves of the current market was the major currency dislocations in the financial crisis, which caused an overshot on both the top and bottom sides of the performance ranges. That said, when we extrapolate a normalized comparative study - balanced by momentum (RSI and stochastics) signatures across the complete run of the 1971-1980 boom, we find an estimated comparative leg higher up to the early part of the next decade. 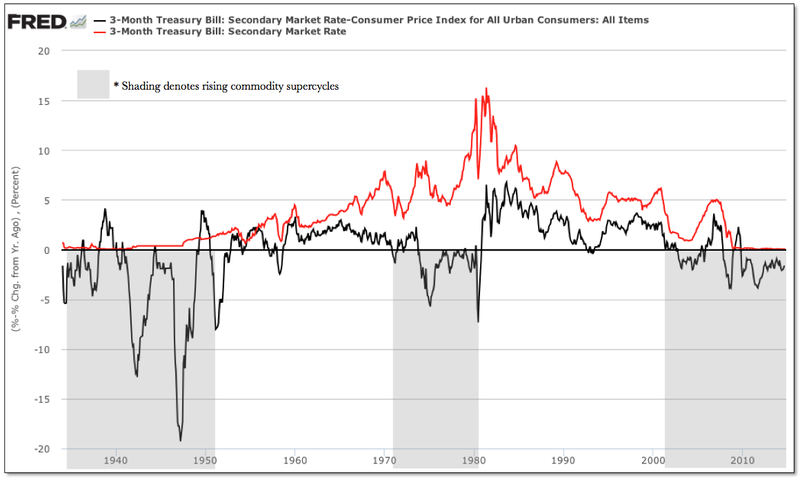 Fittingly, this would roughly match the duration of the previous commodity boom that extended for ~20 years along the mirrored trough of the long-term yield cycle in the early 1930's and 1950's. While the recent prognostications of $700/ounce gold and $50/barrel oil make for great hyperbole by the bears and in the punditsphere, we view them as the typical overshots that are thrown around during the final throes of capitulation. In as much as markets tend to overshoot significant moves, expectations soon follow - always in the same direction of where a market has been trending. With commodities remaining under pressure since Q2 2011, recency biases have entrenched towards further downside in the future. For gold to reach $700/ounce or oil $50/barrel, real yields would be pushed significantly higher - essentially repeating the performance declines for both assets that began in 2011. From what our anticipated range implies for nominal yields over the next few years and how eroded inflation expectations have become today, both targets appear grossly unrealistic. Contrary to conventional wisdom in the market today, we still believe hard commodities such as gold and oil will once again outperform - greatly supported by the tangential performance trends in catalysts such as China and emerging markets. You'll find that for many of the commodity cycle bears today, their theses hinge on a continued catalytic decline in China. This is predominantly because China had played such a pivotal role through the first boom of the commodity cycle in the massive demand created by significant investments in infrastructure and urban development. While the excesses in China have been well described and rigorously debated for the better part of this decade, the just how bad the crash will be expectations by the policy bears have so far been largely unfounded. Quite the contrary, although these concerns remain at the forefront of debate as growth in China has slowed, the leading edge in their equity markets have surprised (finally) many this year - and broken out from a 5 year consolidating range. As much as their arguments are well founded with cogent logic, the reality becomes that increased capital flows and resurrected confidence in Chinese markets will have a mitigating effect on the immanent credit conditions that academics and strategists such as Paul Krugman and Michael Pettis have been greatly concerned with over the past several years - and whom largely expected significant pressures to remain on the commodity markets as China would be forced into a long and painful economic rebalancing. 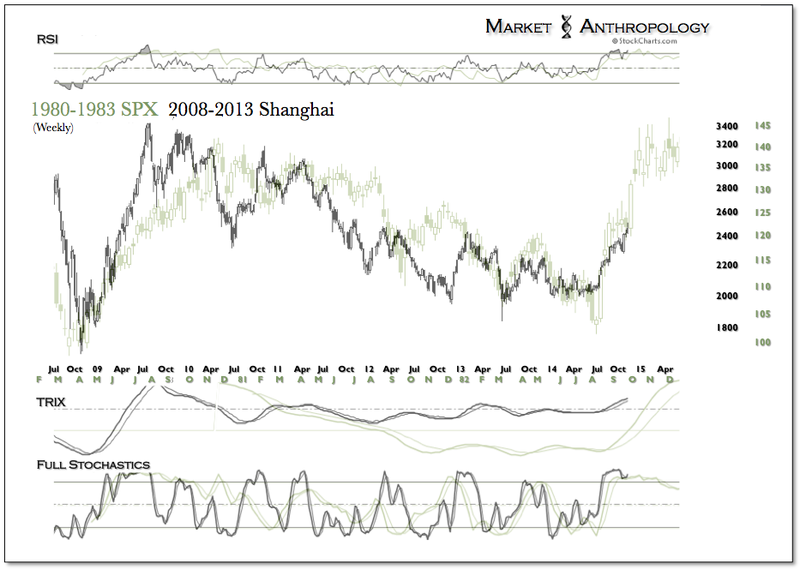 While it remains to be seen weather China has its comparative 82' awakening (see above) or its much anticipated bust, we do believe the recent positive developments in their capital markets will provide a constructive rather than destructive environment for the commodity sector over the next year. All things considered, we'll still take that bet and doubt we will ever see $700 gold or $50 oil again in our lifetime. 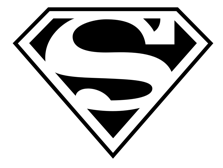 From our perspective, $1400 and $100 appear more likely in 2015 - and by 2022... who knows - the super may have shown up again in this cycle.